The flavor of caramel-chocolate & banana is one of the all time favorite flavor combinations. 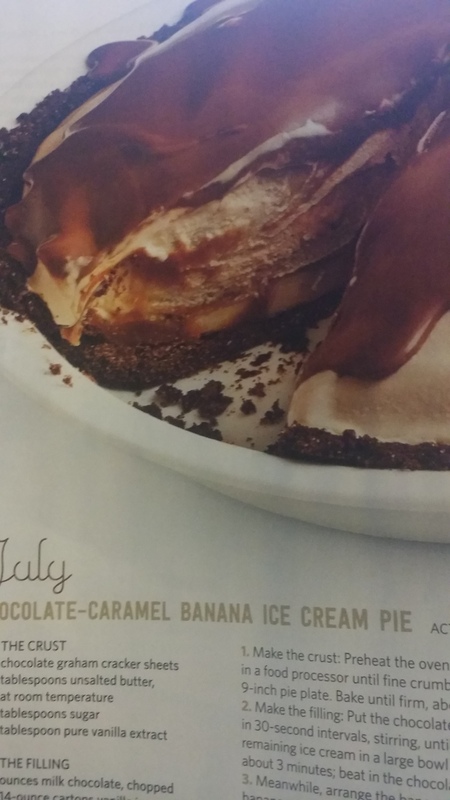 Taken from the new Food Net Work magazine, this will become a permanent recipe in my dessert folder. Make the crust; preheat oven to 350. Pulse the graham crackers, butter, sugar and vanilla in food processor until fine crumbs form. Press evenly into the bottom and up the sides of a 9″ pie plate. Bake until firm, about 15 min. Remove from oven and let cool completely. Filling: Put the chocolate and 1/4 cup ice cream in a microwavable bowl and microwave in 30 sec intervals, stirring, until the mixture is almost melted. whisk until smooth. Beat the remaining ice cream in a large bowl with mixer until fluffy, but not melted. About 3 min. Beat in the chocolate mixture. Freeze until firm about 1 hour. Meanwhile, arrange the banana slices in the pie crust. Spread the caramel or dulce de leche over the bananas and freeze until cold, about 30 min. Scoop the ice cream over the bananas and caramel and smooth with rubber spatula. Freeze until very firm, about 4 hours. Glaze: Bring the heavy cream to a simmer in a small sauce pan over medium heat. Remove from the heat and whisk in the chocolate and corn syrup until melted and smooth. Let cool, whisking occasionally, until spreadable, about 15 min. Slowly pour the glaze over the ice cream, return to freezer until set. Let the pie soften 10 minutes at room temperature before slicing.